Beijing is a large city. Depending on which lists one reads it may be the same size as London. All lists of size are suspect because it is so difficult to define the boundaries for counting purposes. Beijing is a similar size to London with all its suburbs. China has 20 times the UK population, so relatively speaking, Beijing is quite small. 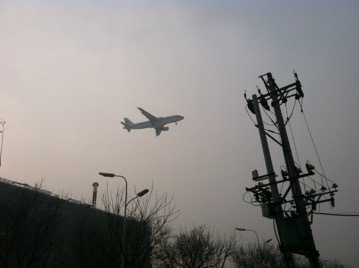 The school is in a district called Shunyi, to the NE of the centre and close to the airport. Think, perhaps, of just a little more state school than St Paul’s, but Shiplake rather than Bradfield; then allow for there being no boarding here. I was using Google maps embedded, but it seems to screw stuff up. I went back to using Google Earth, 20130212. I have marked on here the airport—the white splodge, school, (BSB) and where we live at Shui-mu-lanting. 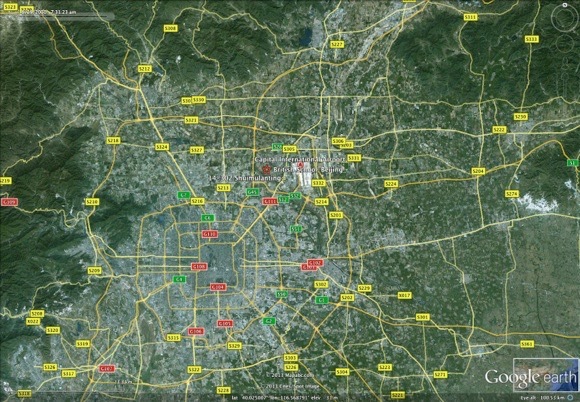 Note the ring roads (we’re up to Six so far, counting from Two); Shunyi is just outside the sixth; it is 30-60 minutes to take taxi or bus or metro into town —the choices each end up taking much the same time because of what I’d call boundary effects—walking to the metro station for example. The dramatic difference is cost—the metro is 2 yuan to go almost anywhere on the system—even C was surprised at that. The terrain map shows how near the sea is. You can still see the white splodge that is the airport in Beijing and see Bohai Bay / the Gulf of Chihli clearly, along with what might be an algal bloom or effluent. The yellow spot to the north of the bay is the Bohai bay sea terminal, which seems to me to be the container port I had thought was due west, at Tianjin. Google Earth and google maps disagree dramatically at what is there. You cam also see the mountains in a NE-SW line that hold in the air pollution.Those mountains off to the north and west fairly easily accessible; we’ve been up some little stuff. Beijing is its own province, autonomous economic region, municipality, or whatever the appropriate translation should be. 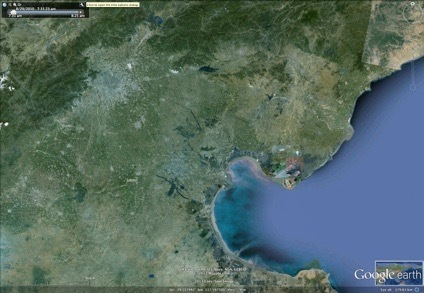 So is Tianjin, not far away on the coast (at the head of the delta, really), in line with Qingdao and Seoul. The remainder of the local area is Hebei and I guess there is a small part of Hebei between Tianjin and Beijing¹. Bei means north, jing some sort of large city, maybe even capital; He means river and I guess He2Bei3 is the northern river region. the river (the Hai He, not the Yellow river) is, as far as I can tell, so multiply divided that I can’t quite locate it. 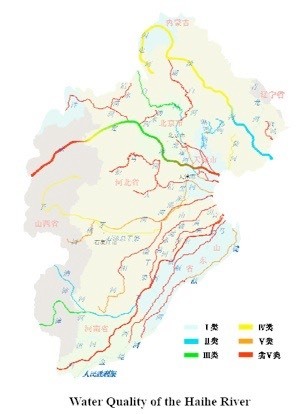 Here’s a picture (right) taken from a report on water quality for the Hai river system. 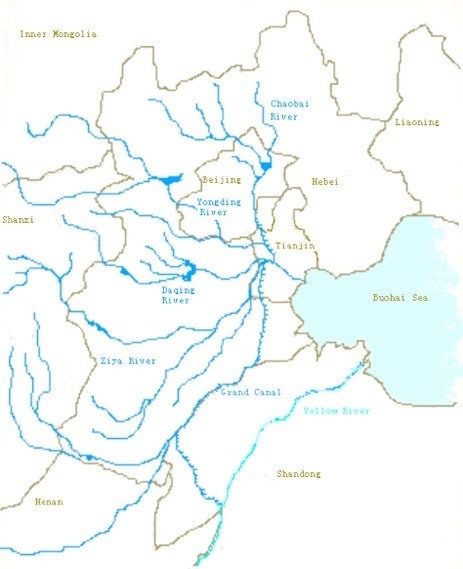 The pale blue on the left hand map (wikipedia) is the Yellow River, matched by the bottom edge of the Haihe basin diagram. Note the Grand Canal, which connects the Haihe, Huang-he and Yangtse. You might note the lack of match between the two maps: I’ve no further comment. My reading of the history of the region says the area used to flood easily and that the river did tend to move around (I’ll bet there are tales of snakes wriggling like the river rather than the other way round). The Chinese love to have standing water, though I suspect they realise that a slight flow is even better, with the result that every city I have been into has something like a canal system. Here, the Forbidden City has water features inside and out (a moat, to Brits) and there are channelised (ugh) waterways everywhere, often open sewers. You can tell which by whether they freeze (or don’t). The near bit of sea is the Bohai (Gulf of Chihli on some maps). HeBei can be called YanZhao after the two states it formed from in early Chinese history [meaning before the Qin and Han dynasties]. There have been people living here a very long time, like 30 centuries. Most of them are dead now, of course³, even the paramount leaders. The weather, “bloody cold”, is a dry continental climate. The winters are characterised by a big anticyclone that settles over Siberia, making them cold dry and windy. January is coldest, averaging between 2 and -8ºC. Spring (April) and autumn (October) tend to be short as things warm up quickly being fairly far south. I can confirm that November was a dire change after Qingdao. That spring change lets the wind throw sand from Mongolia (Inner and Outer, land north of here). It gets wet in the summer, producing 75% of the annual total in June to August; it is good to get away then. The summer is hot, daily average high over 26º May to September and over 30º for the middle quarter of the year, while raining. Not tropical, but warm and wet. I’ll bet its dry even when it’s wet. The air quality is the subject of another article, coming up. 1 Amazing, I was right, there is a little piece of Hebei, an enclave even, disjoint from the remainder. 2 I keep on saying it: lists of this sort of thing are very hard to do. I don’t think 26th is right on any equivalent listing process that compares like with like. 6th, I’d believe. Behind Chongqing, Guangzhou and Shanghai?. HongKong & Macao (and I’ll bet Taiwan) have far higher densities. Other big cities in China are Tianjin, Wuhan, Shantou, Nanjing, Chengdu, Shenyang, Foshan, Jinan, Xi’an, Harbin, Qingdao, Hangzhou, Suzhou, Dalian and ShenZhen. All lists are conflicting—see my writing on lists under universities. The problem is what you get to call the space where you’re counting people. Having established that, there will still be huge open spaces (not unlike comparing NY city with NY state, but not quite so extreme). Then there’s the counting problem. This country has a population of 1.3 billion. But it might be 1.6 billion, making the error not far different from the whole of the population of the US (which I report several times in these pages). China might well have absorbed the equivalent of all Americans and not noticed. One list puts the top ten (biggest cities, whatever that means) as: Shanghai, Beijing, Guangzhou, Shenzhen, Tianjin, Chongqing, Hong Kong, Dongguan, Nanjing, Wuhan. 3 Don’t be silly: they all are. 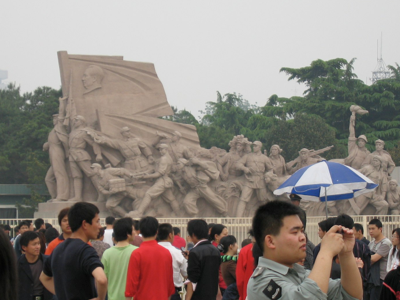 Pictures: Right, a monumental feature in Tian’anmen Square, taken 20080501. 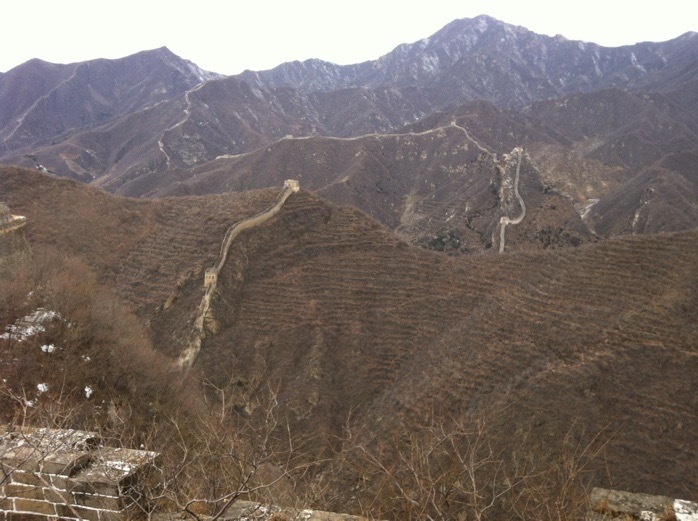 Picture of the wall, not very far away to the north, 20121125, taken from a higher section. You can see the long-term terracing quite well, making the carpet of trees look like corduroy. Thanks to Nick Bourne of BSB for organising the day out. My pictures.